Learning how to take Driving Test When Pregnant! Taking Driving Test When Pregnant! Taking the driving test is a stressful enough experience as it is without being pregnant. There are no rules however that do not allow pregnant women to take the driving test at any stage of pregnancy. There are also no exception made to pregnant women on the driving test. During any stage of pregnancy, you will be required to take exactly the same test as every other learner without special needs.A complete guide of What to expect on the driving test can be found in the Driving test tips section. The driving test will include one of the possible four manoeuvres, a variety of of roads, including dual carriageways if located on the test routes, plenty of town driving and a possibility of the emergency stop. 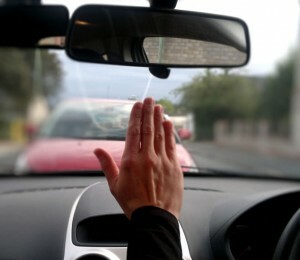 During the driving test you may be asked to demonstrate the emergency stop procedure. There is no way of knowing for sure if you will be asked. In every three tests conducted, one of the tests will include the emergency stop. The examiner has no control over this as these details are given on that particular test syllabus along with other information such as which test route should be taken. The examiner will ask you to demonstrate the emergency stop regardless of pregnancy and at what stage of pregnancy you are. Failure to conduct the emergency stop will render the driving test a failure. Please see the emergency stop tutorial for full details. By reading the in-depth tutorials for these manoeuvres, you will see that constant all-round observation is essential. Depending on the stage of your pregnancy, this can be a little difficult. It is worth remembering that it is perfectly legal and acceptable in the driving test to remove your seat belt if you are going to reverse the car. Removal of the seat belt aids in your ability to look around as you are restrained less. Don’t forget to put it back on as even driving forward slightly will fail the driving test if a seat belt is not worn. Most learner drivers are highly nervous before taking the driving test. It is a little surprising then, that not all driving test centres have toilet facilities. This may become even more of an issue if pregnant. Our driving test centre locations provide information on test centres and may provide information if toilets are available. If your test centre doesn’t offer toilet facilities, it may be worth finding out the location of the nearest facilities to the test centre before attending the test.